AO’s Season Opening Art Exhibit – Saturday, April 6, 2018 from 5:00 pm – 9:00 pm at Ricos Tacos! All Royals Fans, Art Lovers and Sports Lovers Invited! It’s that time of the year again! 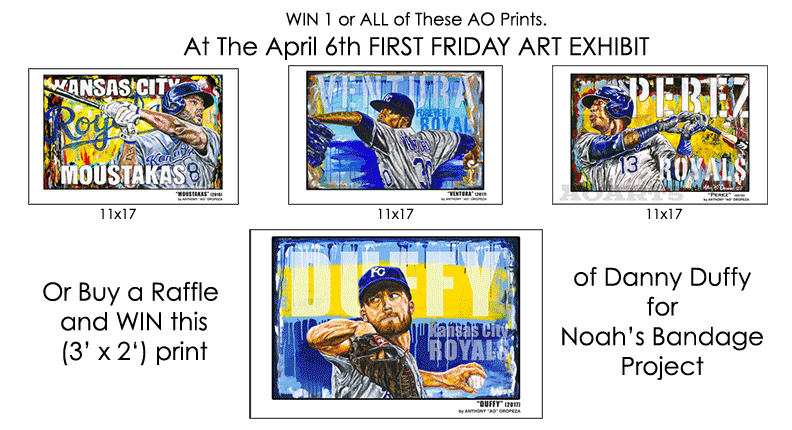 Let’s honor another new KC Royals season with AO & team at their 3rd Annual Season Opener Sports Art Exhibit! Art work featured in the January 2018 KSHB41 Sports News and more will be on display at the Season Opener Annual Exhibit. Keeping it neighborhood friendly and keeping our cost and prices down for our fans and buyers, we are having our event again at a local restaurant. It a one-two punch. Come checkout some awesome art, chat with one of KC’s coolest and most talented artist and grab yourself some great grub from KC’s own Ricos Tacos! COME MEET THE ARTIST, VIEW ORIGINAL ART AND ENJOY A NIGHT OF ART, SPORTS AND GREAT FOOD! Keeping to our commitment to Community“…donating prints and other creative work to organizations that work to assist the poor, sick and uneducated.” AO is honored to donate a portion of his exhibit sales to a local charity.